In a great victory for the people in North Carolina, a Wake County judge granted the North Carolina NAACP’s motion for a temporary restraining order on three of the new Legislative Building rule changes on the grounds that they are overly broad and thus unfit for enforcement. All three enjoined provisions were added to the Legislative Building rules the week before the start of the short session in a blatant attempt to silence the Moral Mondays protests that rocked the NC General Assembly and raised the consciousness of the state last summer. Section III (C) 2b: This section banned the people from impeding or obstructing access to doors, stairways, hallways or the legislative chambers. Judge Fox also ruled this measure overly broad on the grounds that state lawmakers have no more rights to impede the free movement of the people inside the Legislative Building than they would outside on the streets. Section III (C) 4: Judge Fox upheld the ban on signs mounted on sticks, but he temporarily enjoined the new rule blocking signs that could be “used to disturb or used in a manner that will imminently disturb the General Assembly” as overly broad and vague. Today, Judge Fox upheld the rule change that ban people from causing a disturbance or posing an imminent threat of a disturbance as well as the provision that allows the Legislative Service Officer to put more restrictions on the use of space. The NC NAACP filed its motion against the new Legislative Building rules changes on June 11 alongside five other plaintiffs – Douglas and Vicki Ryder, Sylvia Barnes, O’Linda Gillis and Stella Adams. “This decision is a tremendous victory for protecting the time-honored principle of the ‘Rule of Law,'” said Atty. Irv Joyner, NCCU Law professor and a member of the NC NAACP legal team. Joyner and Attorney Scott Holmes argued the NC NAACP’s motion before Judge Fox today. 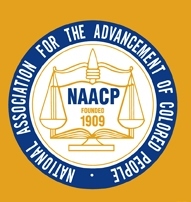 A copy of the NC NAACP complaint can be found HERE. A copy of the newly amended Legislative Building rules can be found HERE.